The Fellowship was fortunate enough to obtain a copy of MIDNIGHT OF THE SOUL #1 from Image Comics. 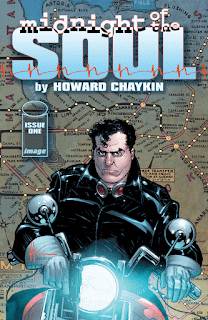 Howard Chaykin writes and draws, Jesus Aburtov colors, and Ken Bruzenak letters. The Second World War is over, but Joel’s problems are really just beginning. He’s been writing for a few years, but can’t get anything published. He basically handed over his house to his brother-in-law. And now he discovers his wife’s secret – she’s been lying about her job in a big way. Joel is angry and betrayed, and as a former soldier he only knows one way to handle it. The war was hard on Joel, invading Europe and getting shot and getting hooked on morphine. The drinking didn’t seem so bad to him after all of that. It certainly makes it easy to sympathize with the guy, and it doesn’t hurt that his narration explains his feelings so well. This is a well-told story, though it’s a simple one (so far, anyway). And the art has a certain emotional sense of its own, which really helps to build the drama. There’s an emotional depth in this story that makes it a bit hard to read, but also makes it entirely worth reading. Definitely check this one out. MIDNIGHT OF THE SOUL #1 is available now at your FLCS or at imagecomics.com.